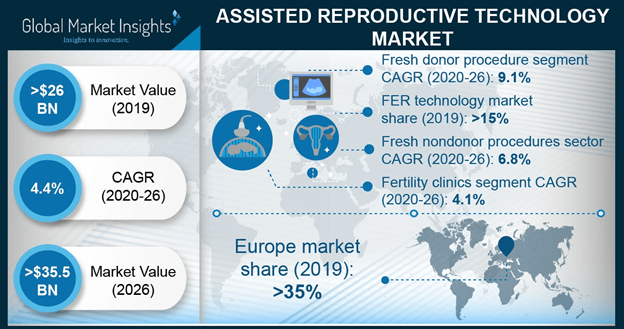 Assisted Reproductive Technology Market size is set to exceed USD 32.5 billion by 2024; according to a new research report by Global Market Insights. Rising prevalence of infertility will act as high impact rendering factor for growth of assisted reproductive technology market. According CDC data, nearly 6.1 million (about 10%) women in the U.S., 15-44 years old face difficulty in getting or staying pregnant. Factors such as heredity, late child bearing and changing lifestyles are the major risk factors that lead to infertility should escalate demand for assisted reproductive technologies. Delayed childbearing is one of the prominent factors leading to growing adoption of ART, especially in European region. Demand for ART has increased significantly in women aged over 40 years in Denmark, France and Norway. Lower cost of ART in developing nations such as China and India will facilitate technology adoption rate. Furthermore, increasing disposable income and changing social factors will positively impact industry expansion during the forecast period. Rising awareness about assisted reproductive technology will assist in assisted reproductive technology market growth. Understanding and having knowledge about success rate of ART technology will augment technology adoption rate over the coming years. However, high cost of ART procedure will restrain industry growth to certain extent during the analysis period. Frozen non-donor procedure segment is estimated to reach over 11 billion by 2024. Minimal invasiveness coupled with cost effectiveness in comparison to other procedures will drive frozen non-donor segment growth. Female partner is not required to undergo fertility drug stimulation or egg recovery protocols in this technique resulting in cost effectiveness will drive segment growth over the projection period. In-vitro fertilization technology segment dominated the industry in 2017 and is anticipated to grow by 3.9% during the forecast period owing to high adoption rate of this technology. In-vitro fertilization allows fusion of sperm and egg outside the body. Furthermore, it escalates probability of pregnancy, thereby leading to high success rate will drive segment growth over the coming years. Fertility clinics end-use segment is estimated to reach over 17.8 billion by 2024. Advancements in assisted reproductive technology coupled with growing demand for infertility treatments will drive fertility clinics segment during the forecast period. Higher accessibility and shorter treatment duration in fertility clinics will positively impact industry growth. U.S. assisted reproductive technology market is estimated to grow by 4.0% during the forecast period. Increasing number of people suffering from infertility problems coupled with high technological adoption in the country will drive U.S. market. Moreover, increasing number of fertility clinics providing ART treatment should positively impact industry growth. Cost effectiveness along with increasing infertility issues will drive India assisted reproductive technology market during the forecast period to reach over 2.0 billion by 2024. Increasing adoption of in-vitro fertilization coupled with rising number of healthcare facilities such as fertility clinics will drive Indian market during the forecast timeframe. Few notable players operating in assisted reproductive technology market are Cooper Surgical, Cook Medical, Irvine Scientific and Thermo Fisher Scientific. Industry players are resorting to strategies such as acquisition and new product launch to sustain industry rivalry. Companies are focusing on developing cost-effective products to gain competitive advantage in developing regions such as Asia Pacific.